Monkey Fist fire poi heads move slightly faster through the air compared to other head types because of their spherical shape. This tends to compliment faster, more tech-heavy spinning styles in which head movement must stay consistent. Monkey Fists sizes are designated by their name. 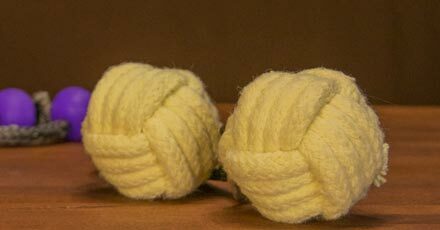 Example: 2.75” Monkey Fists are 2.75” diameter spheres and light (4.3 oz dry). These heads have a solid Kevlar core, ensuring a long burn time. 2.75" Regular Heads are a good "average" size poi head, with a medium-sized flame and a 4:30 minute burn time*. We recommend them for a first fire poi set size if you are unsure of what you may want. 3.25" Large Heads have huge flames and over 5:30 minute burn times*. These are not beginner poi and should be used by folks that really like big fire, have strong shoulders and want a long burn time. 6.5oz dry weight . 3.75" HUGE Heads are among our largest and heaviest heads (9.6oz). They have huge flames and over 6:30 minute burn times*. We primarily use them as rope dart heads, though they can be used as poi heads for the strong, daring, and experienced poi spinner. There are three main choices for leashes: Technora, and twist link chain. Technora is our best feeling, preferred option. With great abrasion and temperature resistance properties (up to 932°F), Technora leashes allow fire poi to feel as comfortable and controlled as practice poi. However, this rope is temperature resistant, not fire proof. If you allow the leashes to rest in flames for an extended period of time (for example: setting burning poi on the ground with the leashes on top of the heads, or a severe mid-burn tangle that takes more than a five - eight seconds to unknot), the leashes may take damage. Technora is recommended for intermediate and advanced poi spinners. Technora leashes will be +/- 1/4" of the overall length requested. Single Loop Handles have a single large cotton loop that partially inverts to tighten on two fingers more snuggly than double fingerloop handles can. *NOTEWhen measuring overall length, single loop handles are considered 2" shorter when we build leashes to account for the reduced length that happens when you invert them to put them on.